This is an important question. We all like to be seen as competent, efficient, compassionate, present, warm, hard working—the list goes on. And while some might think it’s a simple case of “My supervisor does my performance evaluation, and my evaluation forms the basis of whether or not I get a raise or promotion or get fired.”—it’s not that simple or clear cut. Most of us who work in not-for-profits or for government agencies know all too well how stressed the systems we work in can be. When there’s not enough to go around, something’s got to give. At one organization I worked for performance evaluations were done consistently and very thoughtfully because the programs were adequately staffed. As such, performance evaluations were a useful tool in helping us get a sense of the quality and consistency of our performance. In my experience, this has been the exception rather than the rule. In the single adult shelter silo at another organization I worked for, performance evaluations were rarely done on time—if at all. While not condoned, it was understood that because we were in a “high volume, high intensity” setting that was chronically understaffed, resources (time and “person”-hours) needed to be allocated toward meeting contractual obligations. Regular performance evaluations, and supervision, most of the time, went out the window—we were scrambling. In situations like this it’s much more difficult to get a sense of our effectiveness as social workers because we’re either consumed with putting out fires or we’re stepping outside our job descriptions to “get it done”—whatever that “it” was at the moment. Fact of the matter is the answer to the question “Am I a good social worker?” is often a matter of perception. To illustrate this point, here are some of the dynamics at play when trying to answer that question. 1) You meet program goals consistently, but your clients don’t seem to respond particularly well to you. Are you a good social worker? 2) Your clients love you, but your supervisor expresses a concern that certain service indicators are falling short of the mark. Are you a good social worker? 3) What if your program is under resourced, which is fairly common? You’re paid to work eight hours, but out of five case managers you’ve been down one for the last three months. The numbers are tanking. Does that mean you’re not a good social worker? 4) The funder(s) cut your program budget by 15% without being willing to modify your program goals because you exceeded them last year (remember, no good deed goes unpunished). If you and your social worker team members don’t pull off a miracle and meet their goals again, does that mean you’re not good at what you do? What I’m trying to get at here is this—what, exactly, does it mean to be a “good” social worker? And good to whom, and under what circumstances? In my list of the many “masters” we serve, did you notice anyone missing? The measure of your worth as a social worker is not in how much your clients love you. It’s not in whether or not you get all your service plans done on time. It’s not in whether or not your supervisor can check all the boxes. 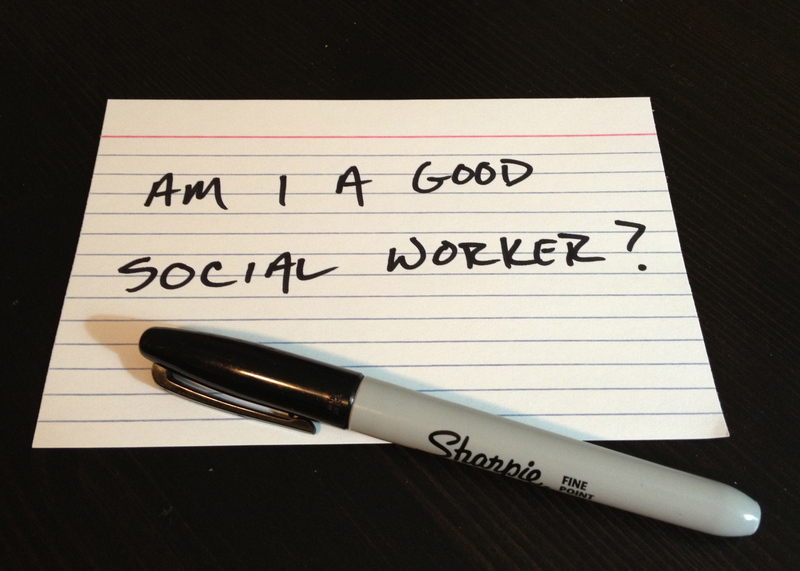 “Am I a good social worker?” can only be answered by you. If it is true that we are our own worse critics, then it is up to us as social workers to maintain not only our professional and ethical standards, but our own standards for how we conduct our work no matter the setting, no matter the population. Standards higher than that which is expected of us. Toward that end I now contend that “Am I a good social worker?” is not even the right question. The right question is the one we ask ourselves while staring into the mirror before getting a well-deserved nights’ sleep. If you can look at yourself in the mirror and say “Yes,” then you could fairly claim “I am a good social worker!” In terms of what happens in the workplace, the rest will take care of itself because your best effort will always be enough (within a larger context we have little control over) and your work will be respected and appreciated. If you look in that same mirror and the answer is “No, I wasn’t on my ‘A’ game today” the good news is that every tomorrow is another opportunity to get it right. This entry was posted in Uncategorized and tagged administration, case management, non-profit, not for profit management, not-for-profit, performance appraisal, performance evaluation, program management, social work, social work clients, social work students, social workers, supervision. Bookmark the permalink. I was nodding in agreement to all of the points that you raised and when I got to “Have I done all that I could do today to help my clients move toward the achievement of their goals?” I smiled broadly. As new professionals (especially during internship), we are always worried – okay… TERRIFIED, that we will do or say something that will hinder a client’s ability to move forward. To a certain degree, I believe that this is a valid concern because people entrust us with their problems, families – their lives. As they stare at us with that lost look that says, “Can you help me?” and “Will I be okay?” inwardly, some of us scream, “Please don’t let me screw this up!” It is a real fear for beginners in this field. (2) We can only do all that we could do to help clients achieve their goals and if at the end of the day, we looked in the mirror and said to ourselves that we did everything possible, then we accomplished what we set out to do. I found this to be helpful, especially when working with clients who presented with suicidal ideation. I remember clearly my first day of field placement class in senior year of undergrad school. My professor walked in and said to the class, “I want everyone here to take the ‘S’ off your chests because the truth is that you are not going to be able to help everyone and you need to know that it’s not your fault!” It was shocking for some of us to hear, but it was real and it needed to be said. The fear you describe is not unusual—it comes from a place of genuine caring. As you gain experience fear is replaced with confidence, and that’s when it really starts feeling good. As for that “look,” that palpable need, it’s very powerful, isn’t it? Respecting our clients means being clear that there are things we can help with, and things we may not be able to help with. While this is understood by most of our clients, I would recommend taking the opportunity to say it out loud, when the time is right. This understanding places our relationship with our clients in proper perspective. We are neither magicians, nor are we miracle workers. We are two people trying to solve a problem. It sounds like you had some good professors, Rosemary. Thank goodness for them! Best of luck in your new career, and thanks again for reading TSWP.